At the age of nineteen Alois Courtal of Normandy, France decided to seek adventure and see the world from the deck of a ship. While at sea Courtal became friends with an older man and fellow shipmate, Charles Lewis. Courtal and Lewis were direct opposites. While Courtal was thrifty, Lewis was lazy and idle and spent money as fast as it came to him. While Courtal was young, Lewis had already passed the midpoint of life. No matter their differences, the two men were devoted to one another. At some point in their seafaring the two men landed at Wilmington, North Carolina and went their separate ways. A year would pass before the two would meet again. 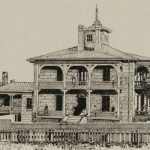 During the winter as 1860 turned into 1861, Courtal heard Lewis was nearby at Smithville, a picturesque seaport, but Lewis was a very sick man. Courtal quickly went to Lewis’s side and spent a week with him. Though he was dying Charles Lewis did two remarkable things. The first was Lewis had a long talk with Courtal in which he told the Frenchman he wanted him to assume the name of Charles Lewis and be Courtal no more. Courtal loved his friend and agreed. In the presence of witnesses Alois Courtal formally assumed the name of Charles Lewis. This done, the dying man dismissed from his room every person except Courtal and proceed to take care of the second remarkable thing which was to finally surrender his life’s secret. The dying man pointed to a nearby telescope case and instructed his friend to open it. Courtal, opened the case and soon discovered there was a hiding place and in that hiding place was a piece of paper with a map drawn upon it. Courtal gave the dying man the map who took it in his bony fingers and made Courtal swear that he would never cease his efforts to discover what the chart might reveal. Courtal promised, and Lewis told him his life story saying he was of English descent but was born in Canada. His grandparents had been residents of Guilford county, North Carolina, and near Greensboro had buried during the Revolutionary War, or just at its commencement, a chest containing gold coins and bars. Lewis advised Courtal he had been told the chest was a curious piece of workmanship and that Courtal might not comprehend how to get inside at first, but Lewis shared all he knew about it best he could. 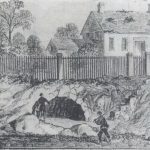 Lewis was expiring quickly but managed to advise the plantation was some ten miles north of Greensboro, and he had searched a property in Guilford county on which he thought the treasure was buried. With each word Lewis’s voice grew weaker, and at last he gasped and with a last effort he drew Courtal towards him and said with set teeth and clinched hands, his voice faint and ghostly. All he said was, “I know…”, before he fell back dead. Courtal, took on the identity of Charles Lewis from that moment on and took his friend’s body to Guilford county and gave him a proper burial. The Civil War came on soon after that and Courtal who was now Charles Lewis joined a regiment of North Carolina volunteers. It is said he was a brave soldier and was one of several who stormed the bloody ridge at Gettysburg. No soldier went further that day and none more gallant than the Frenchman who fought for his adopted country. Eventually through the years his neighbors and friends would know about his treasure seeking but only one person had seen the map. During the war Lewis was wounded at some point. Lewis showed the map to his captain, bidding him to take it if death took him, but in a week the captain was dead while Lewis lived. At the end of the war Lewis settled in the little town of Reidsville, North Carolina, a part of Rockingham county and married there. From time to time he made a search for the treasure of which he alone had the key. Just to be safe Lewis kept the treasure map in a safety deposit box at the bank in Reidsville. In 1884, his wife died and three years later with more time on his hands he again took up the task of finding the treasure. His neighbors held him in high esteem and were used to his stories of buried treasure. 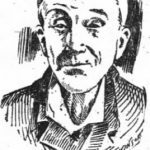 By 1887, Charles Lewis who began his life as Alois Courtal was an old man. Many had come to Lewis over the years begging to help him find the treasure for a price, of course. Others had sought out Lewis and offered him great sums of money to buy the map, but Lewis refused. He had made a promise to his friend and wanted to see it through. The last search Lewis was able to execute took place about two miles north of the Revolutionary War battlefield at Guilford Courthouse. Once again, no treasure was found. Was Alois Courtal a real person? What about Charles Lewis? Was any treasure of gold coins and bars ever unearthed in Guilford County? I started nosing around various census documents. On the 1870 census I found a man by the name of Charles Lewis who was about 48 years old at the time and claimed to have been born in Europe. 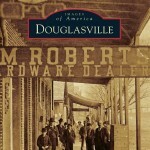 In 1870, he lived in Williamsboro, North Carolina which is in Rockingham county. The woman with him which the census taker inferred was his wife was named Elizabeth. The 1880 census had the same information, but indicated Charles Lewis was born in Norway. Mistakes including similar words and misspellings are common as census takers would write down what they thought they heard. Could Norway be Normandy? Yes, I think so. Elizabeth’s maiden name was Cason. A marriage license indicates they married August 13, 1890. Some of the documents indicate she was old than Lewis while others do not. Next, I tried to find various plantations known to be in Guilford County, but nothing panned out. I went back to the newspapers and discovered I had access to “The Reidsville Review,” the place where Courtal/Lewis lived. I found an ad titled “Notice to Creditors” dated December 2, 1892 where Charles was deceased, so at some point he died in 1891 or 1892, and it looks like he never found his gold, but wait a minute…I need a better payoff for spending all this time chasing down a story, you know? I waited a couple of days and did another deep dive in various North Carolina papers using “Charles Lewis” and “gold” as my search terms. I found an article dated February 7, 1896 in “The Reidsville Review” telling how J. H. Parker at High Point, North Carolina had learned about buried treasure that might be at Sunbury, a station on the Cape Fear & Yadkin Valley Railroad, and yes, he was able to find it. The total given was $18,000 in gold bars and coins. So, apparently the story was true and it’s evident the map had some type of error in it that kept Courtal/Lewis from finding the treasure. 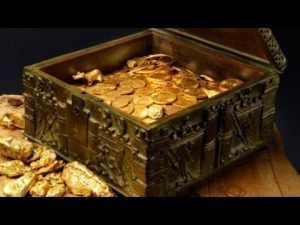 I find it interesting but not surprising a couple of weeks after the announcement of the gold find another article was published that stated the gold find was just a rumor. Seriously, if I had found that much gold I’d be quick about saying it was just a rumor, too! Picture Credit: See this wonderful online article/picture source also dealing with buried treasure here.